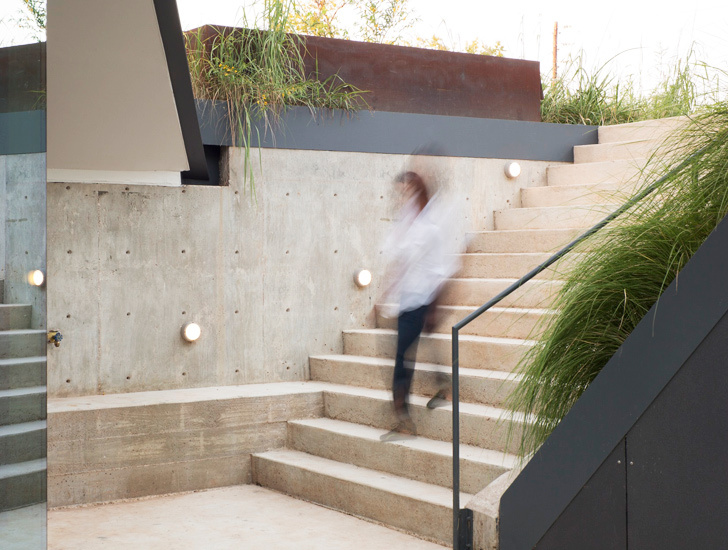 Located on a rehabilitated brownfield site in Austin, TX, the <a href="http://bcarc.com/Project/edgeland-house">Edgeland House</a> is a unique, triangular home designed by <a href="http://bcarc.com/">Bercy Chen Studio</a> that is built into the earth and covered with a thick layer of sod. Because it is an earth-sheltered home, the Edgeland House is highly efficient, and it can stay warmer in the winter and cooler in the summer from the added thermal mass and insulation. Additionally, the high-tech home features hydronic heating and cooling, geothermal heat exchange, and phase‐change thermal heat storage. The form of the home itself is shaped like a scar, perhaps commenting on the site's industrial past, while the lush sod represents healing. "The project raises awareness about a diminishing natural landscape and its finite resources by creating a balance between the surrounding industrial zone and the natural river residing on opposite side of the site," according to a statement from Bercy Chen Studio LP. 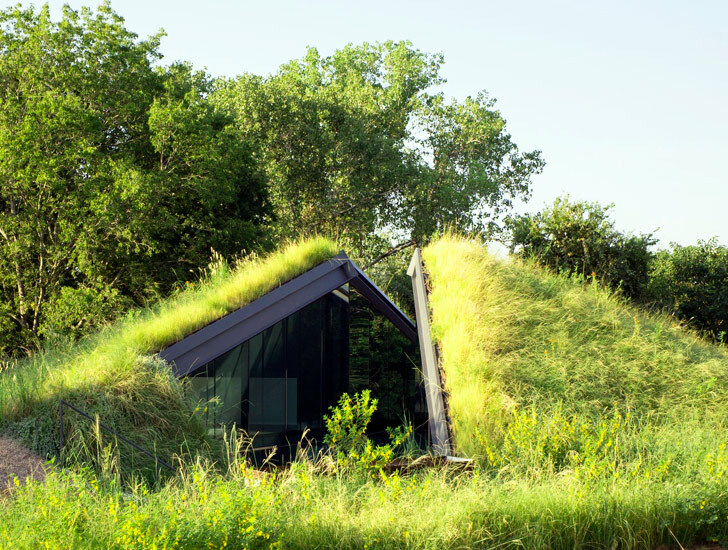 In order to build the house, the architects excavated 7 feet of soil from the site, and they installed a thick green roof to the top. According to the architects, the home is a modern reinterpretation of the Native American pit house, which is one of the oldest types of housing used in North America. 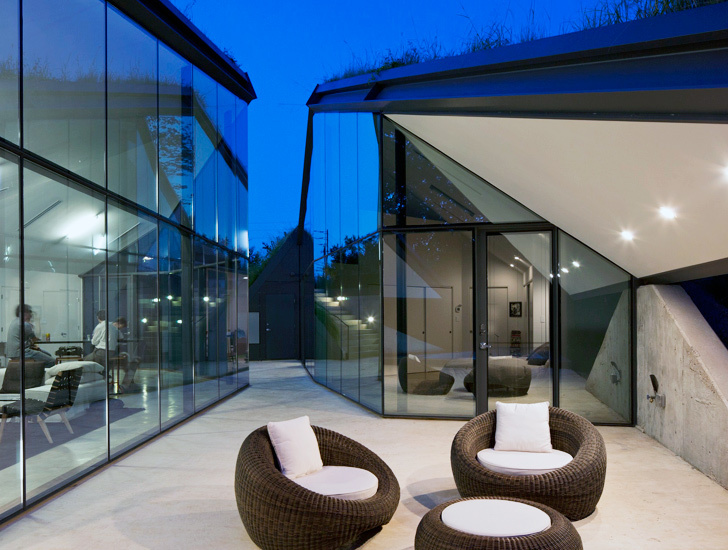 Like a traditional pit house, the Edgeland House is built below grade, and it takes advantage of the earth's thermal mass for more efficient heating and cooling. The home also features a "smart pool," which provides additional thermal mass that ties into the geothermal heating and cooling system. 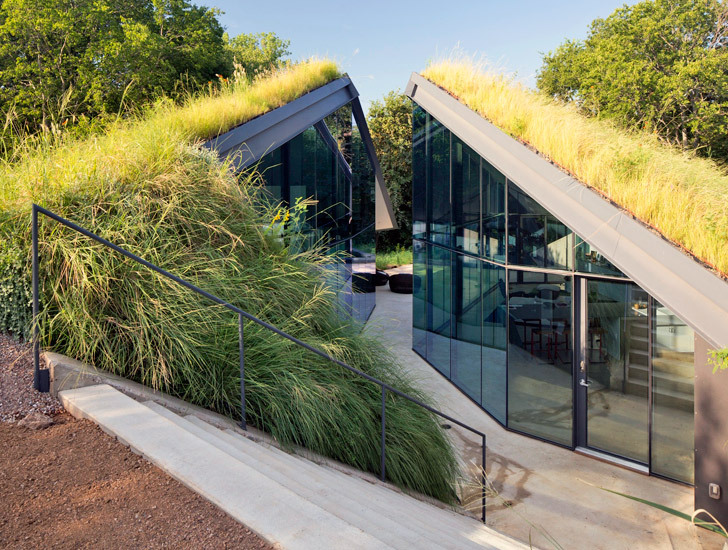 Located on a rehabilitated brownfield site in Austin, TX, the Edgeland House is a unique, triangular home designed by Bercy Chen Studio that is built into the earth and covered with a thick layer of sod. Because it is an earth-sheltered home, the Edgeland House is highly efficient, and it can stay warmer in the winter and cooler in the summer from the added thermal mass and insulation. Additionally, the high-tech home features hydronic heating and cooling, geothermal heat exchange, and phase‐change thermal heat storage.